With the release of my novel The Marriage Alliance happening on Tuesday, August 15, I think this is the time to share some historical facts of my romance novel’s setting. 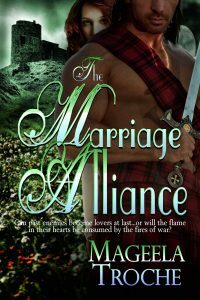 The Marriage Alliance is set in 1256 Scotland. This era is a time when all seemed bright for the nation. No one knew that darkness would swoop in and cast the nation in a war. In 1249, seven-year-old Alexander’s father died. Many sons lost their parents however, this boy was not another farmer. He was the Prince of Scotland. In July, Alexander sat upon the Stone of Scone and became the King of Scots. Some historians consider this period in Scottish history as the Golden Age. There was relative peace in the nation (though it was the Middle Ages so it wasn’t exactly peaceful) and the throne was secure. At this time, England and Scotland enjoyed a close bond because of the relationships between the nobles of both nations. 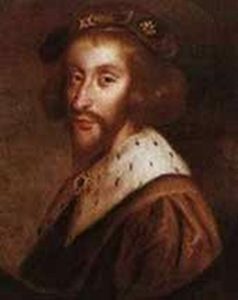 Many Scottish nobles possessed estates in England including the King of Scotland. To keep this ties knotted, Alexander married the daughter of the English king, Henry III. In December 1251, Alexander traveled to York to be knighted and celebrate his marriage to Margaret. Henry III asked Alexander to do homage. But the young king understood the politics at play and replied, “I had come to marry not to answer so difficult a question.” Thankfully, this young king had loyal nobles in his government so he was able to reach his majority without a grab for his crown. The king had plans to grab some land–some islands off the coast of Scotland. Alexander became the leader of a nation that was smaller than the Scotland we now know. At this time, the Hebrides, Shetland, and Orkney islands fell under Norwegian rule. To fulfill his father’s dream, Alexander first tried diplomacy to win the isles yet that failed. 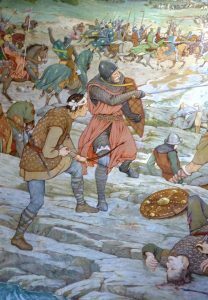 So in October 1263, the Battle of Largs happened. 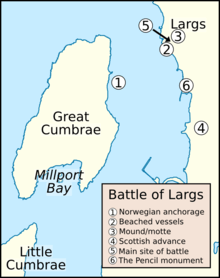 The Battle of Largs is not considered a proper battle, more a series of skirmishes that occurred on the beaches of Largs. The King of Norway and his fleet sailed to the western coast of Scotland. The Scots were helped by a gale that crushed the Norwegian fleet. The King of Norway failed to secure the isles and soon sickened and died. After this, the Hebrides became part of Scotland. By 1275, the Queen of Scotland Margaret and sister to Edward I of England (also known as Longshanks and the Hammer of the Scots) died. Margaret was much loved and has a religious following in the nation. Now a widow, Alexander had no reason to marry again. He had three children, an heir, spare, and a daughter who was married. Soon, death came for them all. David, the youngest son, died first then his daughter died in childbirth though her daughter (known in history as Maid of Norway) survived. Then on the 17 January 1284, his heir and namesake perished. With all three children lost, the king had to marry again. He was still a young man so the nobles were not worried that more children would one day come. He married Yolande, Comtesse de Montford, daughter of Robert, Comte de Dreux. Five months after their marriage, the king was in Edinburgh to meet with his council. While he was in the royal burgh, the weather took a turn for the worst. That did not stop the king from setting out to the royal castle named Kinghorn located in Fife. Though the storm was a northerly gale with heavy snow and led to a very dark night. He was able to sail across the Firth of Forth. The men in his party begged him to stay the night instead of continuing in his travels. He continued onward. In the darkness, somehow the King of Scotland fell to his death. His body was found at the foot of the hill the next morn. The spot is now called the King’s Crag. He was 36 years old. His wife was pregnant but she soon miscarried and the Maid of Norway died on the crossing to Scotland. The Wars of Independence would soon rage. If Alexander had rested his head instead jumped into his saddle then Scottish and world history would have changed.